Legal Web Design takes attorney website search engine marketing to the next level. Search engine optimization for lawyers – attorney SEO for short – is becoming an increasingly important part of running a successful legal practice. That’s because today’s clients are no longer looking towards the Yellow Pages or print advertisements to find an attorney – they are turning to search engines like Google, Yahoo, and Bing. If you want clients to find your practice instead of a competitor’s, you are going to need the right legal search engine optimization team on your side. It is getting harder than ever for a law firm to reach one of the premier search engine positions, and doing so takes more than just a few minor changes to your legal website. Legal Web Design helps you avoid mistakes and make the most of online marketing opportunities. 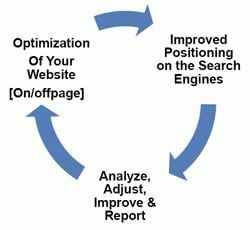 The Legal Web Design team expertly helps attorneys improve their search engine rankings. A successful SEO plan is conducted by effectively implementing both on-site and off-site optimization techniques using our tried and true SEO process. Implementing a search engine optimization strategy for your legal website is an effective, high ROI way to bring new clients into your practice. Contact us today to set up a free consultation to see what the Legal Web Design team can do for you.